For those parents who are forever seeking ways to feed their children healthy food, this will be a great solution you can add to your secret bag of tricks. Every kid loves pizza and there is no reason they have to know just how healthy our pizza recipe is. You know and that's all that matters. Besides being scrumptious, the whole family can build individual pizzas to their own liking, adding fun to health. The more you can create associations of "tasty" and "fun" to healthy eating, the better. Here is how you do it. Putting the word "healthy" into pizza starts with the crust. 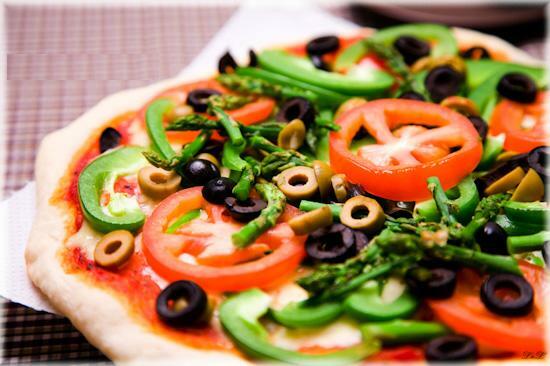 Most standard pizzas your kids are eating are full of nutritionally useless white gluey flour. Did you know that white flour spikes blood sugar faster than white sugar? That makes white flour very addictive. The fast alternative is using whole grain pita shells. All grocery stores should carry them in the bread area. They are a perfect size for making individual pizza masterpieces. Look for the thin ones; they have half the calories than the thick ones, 70 calories compared to about 150 calories. Now you may have to take some searching and reading the ingredients to find better food for your family to eat. But before you know it you will familiarize yourself with a whole new part of the grocery store. It's worth the effort. If you cannot find the thin type of whole grain pita shells, don't panic, the more common thicker ones will work just fine. Just make sure they are whole grain. Canned pizza sauce can be found on the shelf beside the spaghetti sauce. Again, read the ingredients. Try to find a brand that is not full of unpronounceable chemicals and oil, unless it is olive oil, preferably, extra virgin olive oil. If you’re really ambitious, you can always make your own pizza sauce. Blend five Roma tomatoes with two tablespoons of extra virgin olive oil, and season with salt, garlic and Italian Spice, to taste. To be honest, we just use the canned stuff. May I introduce you to goat’s cheese. A goat's digestive system is much closer to ours than a cow’s; therefore their milk is more digestible for humans. And yes, you can buy mozzarella goats cheese. If you don't tell them nether will I. The stuff tastes great! There is also soy cheese, but again read the ingredients. Just because it's soy doesn't mean it's healthy. If you absolutely must use regular cheese, go easy on it. Buy stronger tasting cheese, like cheddar so you can use less. Parmesan is great too because a little goes a long way. Now we get to the fun stuff. I am going to give you a list of great pizza toppings but I am sure you can think of many more. You can put just about anything on pizza, creating a mélange of unique flavors and bright color. You can dice your toppings large or small. The rule of thumb is strong flavored toppings like onion, garlic and hot pepper should be diced finely, were tomato or mushroom can be sliced. Prepare all the toppings ahead of time. Preheat oven to 450 Fahrenheit. Have the pitas laid out on cookie sheets, two will fit per sheet. You can fit two sheets in your oven. Allow the family to build their own pizzas, ladies before gentlemen. Bake for 10 to 15 minutes or until cheese is melted. Expect demands for seconds! Suggestions: I like a little cheese under and on top of my toppings, it helps hold the mountain together.